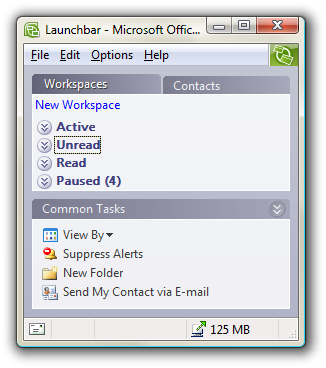 I've been running FolderShare (a Windows Live Service) and Microsoft Groove (part of Microsoft Office 2007) concurrently for the last few weeks. Both products are Microsoft offerings, and both provide file synchronization features. FolderShare is lightweight and "just works". For over one year now I've been synching documents, IE favorites, OneNote notebooks, and scripts across 4 different machines with no issues. FolderShare creates a secure P2P network to perform the exchanges, and the only limitation I know of is the file size limitation (no files over 2GB). All you'll see of FolderShare on your desktop is an icon in the taskbar notification area. All the sharing configuration takes place inside the web UI of FolderShare.com. Setup is simple, and there are no knobs to tweak and twiddle. The notification icon can give you some transfer statistics and tell you what is currently "in process". 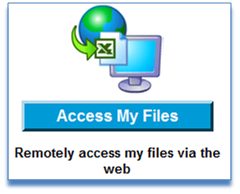 Logging into FolderShare.com gives you the ability to download any file (not just the files in shared folders) from any of your computers that are online and running the FolderShare application. This feature has proven useful to me more than once, however, I'm sure some of you are having cardiac arrest at this moment by picturing your CFO downloading PPT files using a public computer with a keylogger installed. FolderShare is smooth and simple. Groove is geared towards enterprise level collaboration, and as such is a bit heavy handed. For personal synchronization of files, Groove is overkill. If you are working with a team and need to manage contacts, store and forward messages, configure alerts, and manage multiple identities - then the rich client interface of Groove will give you more features than FolderShare. The downside is – sometimes I notice Groove is running (noticeable CPU and memory consumption during large synchs), and at least once I noticed Groove was not running – at least it wasn't synching files. Repeated tapping on the computer didn't fix this problem (it never fixes any software problems, but the physicality is therapeutic). Bits didn't start flowing until I restarted Groove. Groove uses its own Simple Symmetrical Transmission Protocol (SSTP) for secure P2P exchanges, although it appears it can also deliver a payload over HTTP (using a corporate Groove Server). FolderShare is all I need for personal use, but I wonder what will become of the product. There haven't been any noticeable changes to the software since Microsoft acquired the creators (ByteTaxi) in November 2005. The software is still listed as "beta" and the site contains copyright notices for ByteTaxi Inc. It would be wonderful if such a simple, easy technology was baked right into the OS. Thanks for the info! I was just thinking about switching off FolderShare and seeing if there was a better option out there since the product seems to have no future movement. Groove was something I considered. But it looks like I'll stick with FolderShare too. FolderShare has another limit. I think it's 20000 files per library. I've hit it. But I really like FolderShare as well. Yeah, the file # limit is the deal breaker for me. I understand it, I just can't use it. Foldershare just works. It's awesome. Unless you are outside it's limits. For me, my Portable Firefox is the problem. I scrapbook so many things, that my file limit is reached and exceeded easily. Before that happened, I was completely in love with FolderShare. The file limit I personally hit with FolderShare was 5,000 by trying to sync my music library. The work-around I used was to break up the library into physical folders each under the limit. I travel quite a bit, so I couldn't live without foldershare frankly. I hope MSFT continues to keep it around. Foldershare is the best thing since sliced bread IMHO, I use it constantly to exchange files from home to office. The # of files limit is a bit of pain because I wanted to sync my music collection, but I guess I am stretching what the product was designed to do. I also wish FS did a better job with open files, it insists on making copies like blahFile.FSName on Machine.ext, which is a real annoyance. Groove is cool, but I can see that it doesn't serve much purpose for the individual user. However, I have Groove paired with SharePoint, and my team all use Groove to participate documents to the workspace, then they just end up in SharePoint document libraries. From what I understand, FolderShare technology is behind the Shared folders in the latest Messenger clients. The access-any-file-from-anywhere is useful, but you can turn it off in the satellite settings dialog on the Transfers tab: "Allow web downloads from this computer" checkbox can be turned off. I have used Foldershare for some time and have kept 4 computers in different locations in sync very easily. Until last Saturday. I have 44,000 files in my office directory (I was using Foldershare professional before the limit was imposed)and my home computer showed that I had just 3,500 files in that directory. I checked the other three computers and two had already been reduced to 3,500 and the 4th was just getting started on deleting so I stopped the sync. Disaster. What I later figured out was that one of the hard-drives got corrupted and was only showing files beginning with numbers or A to C. D-Z were all gone. I did a chkdisk on that drive and was able to recover the missing files. I would say that is a big problem with Foldershare and I am looking for a new sync program.